Wawasee’s impressive start to the season continued Saturday as the Warriors went 3-0 to claim the title at Jimtown. Wawasee lost just one court against South Bend Adams, but swept Jimtown and Wabash to finish the day 3-0 in the team standings and 14-1 in duals. Kendra Doerr at No. 1 and Peyton Rookstool at No. 2 were both 3-0 on the day. Doerr won both the Adams and Wabash matchups by straight shutouts and taking a 10-point tiebreaker against Jimtown. Rookstool finished up her day by losing just two games against Wabash. Abby Morehead and Tate Cowan won their first varsity tournament matchups as a duo, going 3-0 at No. 2 doubles. Wawasee’s No. 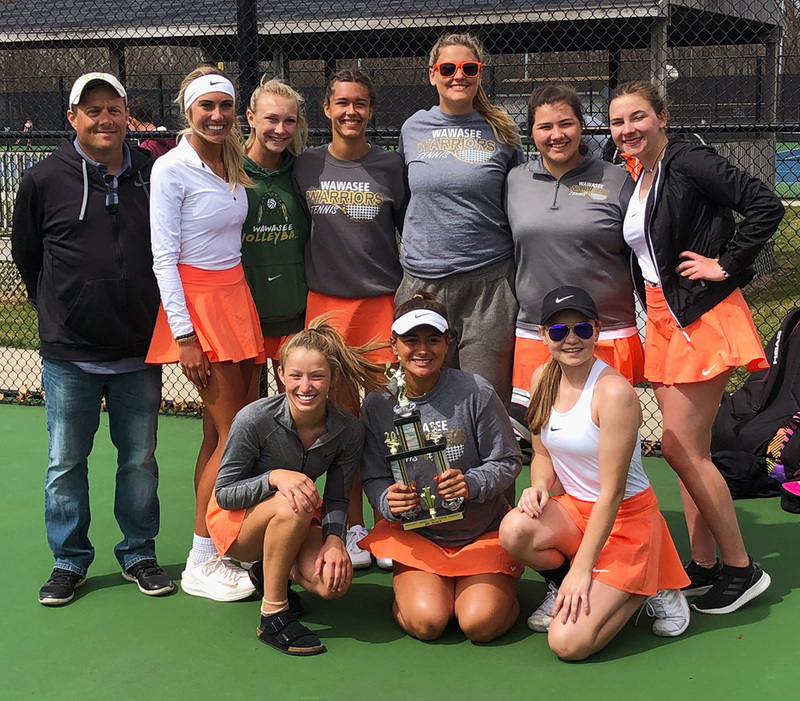 1 doubles courts had Kaitlin Graber and Molly Jones win against Jimtown and Adams and give way to Valerie Haessig and Ava Harker in the Wabash match, which Wawasee also won. Elizabeth Kleopfer went 2-1, beating Jimtown and Wabash in losing just two games in the two contests. Wawasee has opened the season 5-0 and will get back at it Monday with Central Noble then take on defending Northern Lakes Conference champion Concord Tuesday. 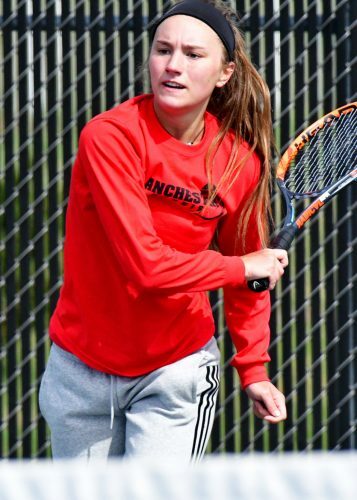 Manchester’s Eva Bazzoni follows through on a shot against Valpo’s Abby McBride at the Warsaw Tennis Tournament. Triton earned four court wins among its production at Saturday’s Plymouth Invite. Each of its singles along with its one doubles went 1-2 in their three court matchups. The two doubles went 0-3 on the day. Triton lost all five of its opening matches, but had Molly McFarland beat Michigan City and Ivy Powell beat Columbia City in the second round. Maddie Ritchison beat Michigan City and the duo of Emma Hepler and Lexia Hostrawser beat Peru in the final round. Triton competes Monday at Rochester. Warsaw hosted its annual varsity tournament Saturday, with eight teams involved. 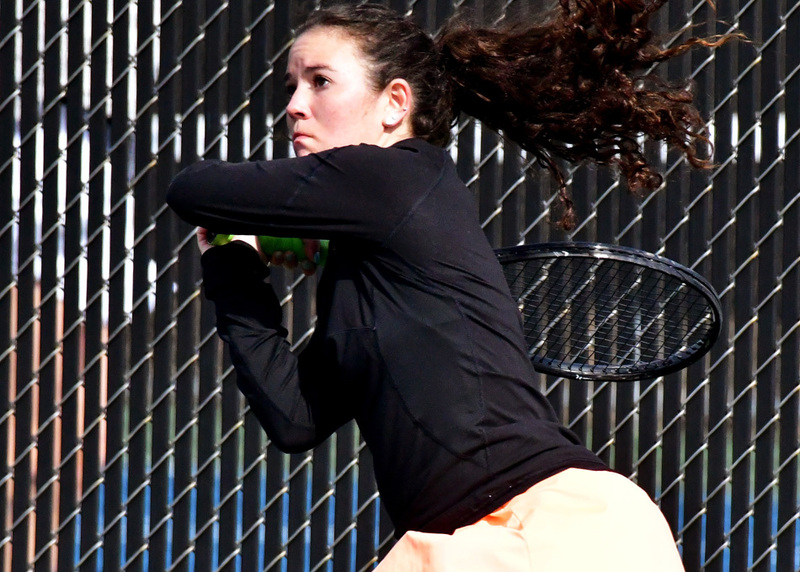 The Tigers placed seventh out of the eight teams with eight points. Munster, led by championships from No. 1 singles Sanjana Tallamraju and No. 2 doubles team of Monica Fronczak and Hazel Wolf, took the team title with 20 points, ahead of Penn and Homestead. For Warsaw, top billing came from three courts taking sixth place. Alyssa Zellers at No. 1 singles, Rachel Boyle at No. 3 singles and the No. 2 doubles team of Addison Marshall and Marie Frazetta all took the sixth place ribbons. Izzy Ray at No. 2 singles and the team of Raegan Merchant and Rachel Yeager at No. 1 doubles were both seventh in the tourney. Manchester took fifth, led by Eva Bazzoni in third at No. 3 singles and Halle Briner fourth at No. 2 singles. The No. 2 doubles team of Rebekah Pyle and Alyssa Marvel also placed fourth for the Squires. Warsaw returns to action Tuesday at Plymouth.